Do you want to increase your email open rates, boost your click rates, and decrease your unsubscribe rates? 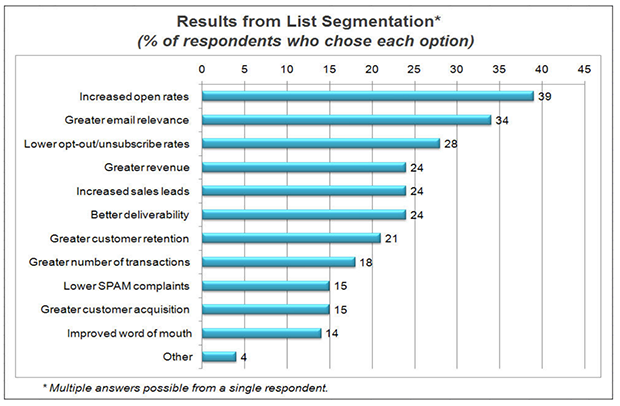 Smart marketers use email list segmentation to drastically improve the effectiveness of their email marketing campaigns. In this guide, we’ll share 50 email list segmentation ideas that the pros use to create targeted email lists. Did you know that personalized emails deliver 6X higher transaction rates, yet 70% of brands fail to use them? That is great news for you because in this guide, you are about to learn how to segment your email list and get a huge leg up on your competitors! Email list segmentation is a technique that email marketers use to send highly targeted emails by dividing their list up into smaller groups, or “segments”. By understanding the specific characteristics that differentiate each of these groups, you can tailor the content of your email marketing campaigns to each individual segment and significantly increase your conversions. 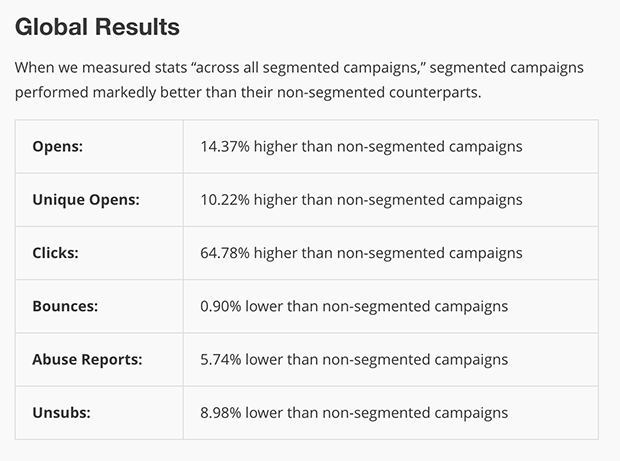 MailChimp pulled data from their users who use list segmentation, and discovered that segmented campaigns had open rates that were 14.37% higher, clicks that were 64.78% higher, and 8.98% lower unsubscribe rates than non-segmented campaigns by the same users. In 2010, Lyris, Inc. reported that email and online marketers are not using some of the most basic email marketing tools, techniques and practices (such as email segmentation) as frequently and extensively as they should. They also found that, although nearly three-fourths of survey respondents claimed to use list segmentation, the ways that they were segmenting their lists were not optimal. For instance, the most popular method – segmenting by demographics – is less effective than the other targeted email methods which are less commonly used. Even so, when those who used email list segmentation were asked the top three areas where they saw results, the majority of respondents cited increased email open rates, greater email relevance, and lower unsubscribe rates. Now that you understand why email list segmentation is so important, let’s go over a few best practices. Everyone’s business is different, so the ways that you choose to segment your email list will differ from how someone else segments their list. Email Segmentation Software – First, you’ll need an email service provider that allows you to segment your list. We’ll share our recommended services below. Page-Level Targeting – Next, you’ll need a tool that will allow you to create targeted email optin forms for specific website visitors, and then add them to the appropriate email segments. You can do this with OptinMonster, which we’ll describe in more detail below. Lead Magnets – Finally, you’ll need to create some lead magnets that will allow your website visitors to self-identify as belonging to one of your segments. We have a huge list of lead magnet ideas here if you need help creating effective lead magnets for targeted email marketing. As we mentioned above, you are going to need an email service provider that allows you to segment your list, plus you’ll need a tool that will allow you to create targeted email optin forms and add them to the appropriate email segments. For your optin forms, OptinMonster is by far the most powerful solution. 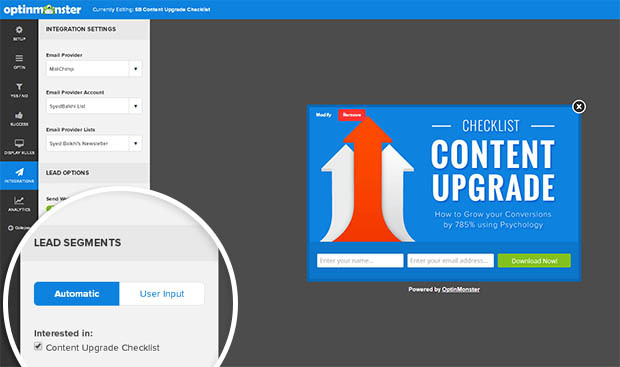 OptinMonster’s page level targeting module allows you to display unique optin offers based on the visitor’s location and interaction on your website. For instance, if you want to show a specific lead magnet only to visitors who are reading blog posts from a specific category, you can do that. 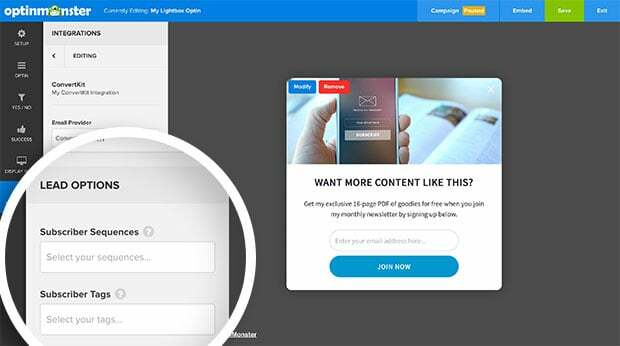 Once you’ve captured their email address with a high-converting optin form, OptinMonster integrates with your email service provider to add new subscribers to the appropriate segment(s). 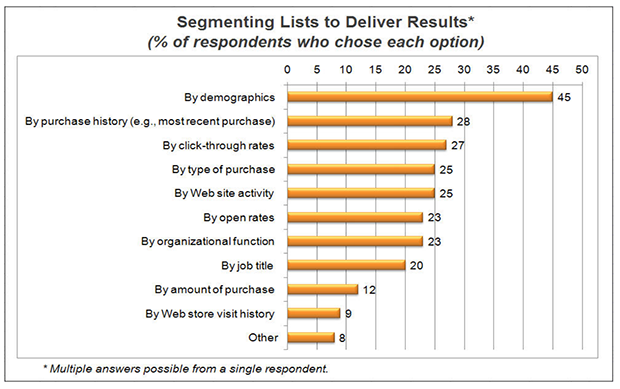 Are you ready to start segmenting your email list? Don’t neglect your brand new subscribers by taking their email address and leaving them in the cold. Instead, give them a warm welcome with a welcome email. 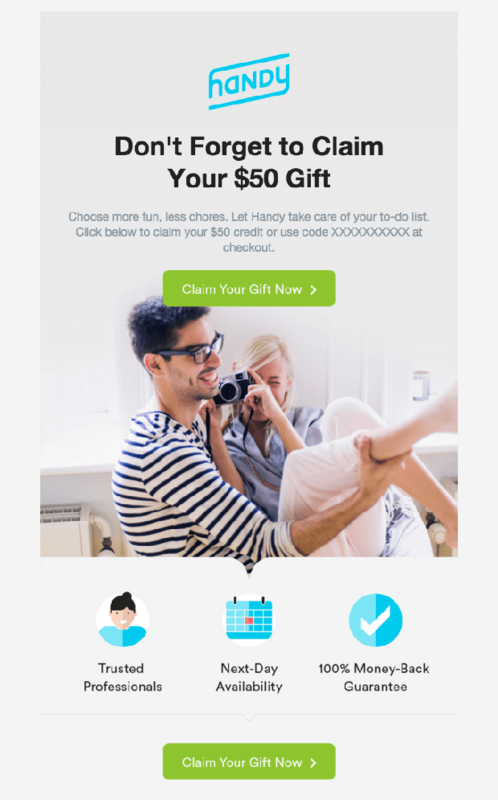 Simply add an exit-intent popup to convert abandoning website visitors into email subscribers. Then engage with them to convert them into customers. 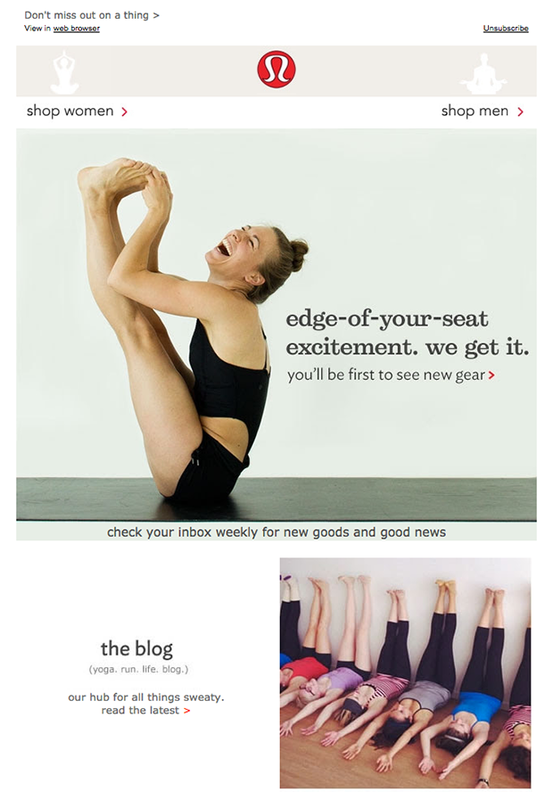 Lululemon uses their welcome email to remind you of the benefits of being a subscriber: you’ll be the first to see new gear. They also set expectations by telling you that they’ll be emailing you once per week, and they introduce you to their blog. 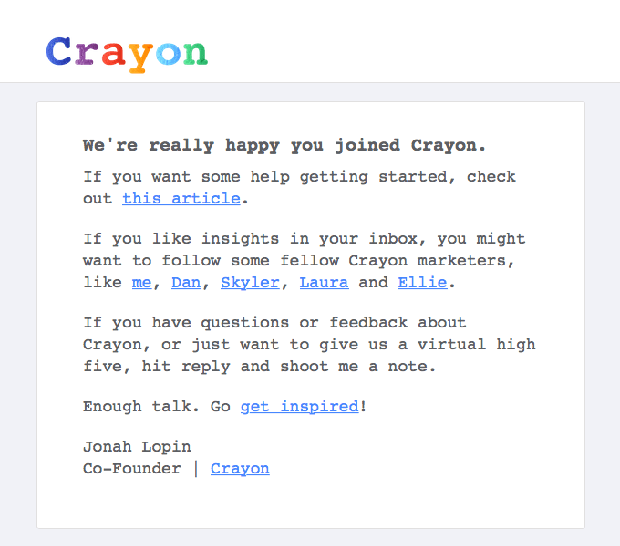 Crayon’s welcome email helps you to get started with an article for new users. They also recommend some fellow Crayon marketers to follow. But why stop at just one welcome email? You could even send a series of emails to all new subscribers with the best of your blog content, or show your new app users how to take the first step, and then the next, and the next. Whatever you decide to do with your welcome email or welcome sequence, make sure that you are introducing your new subscribers to your best stuff, so you can begin to grow that relationship with them. 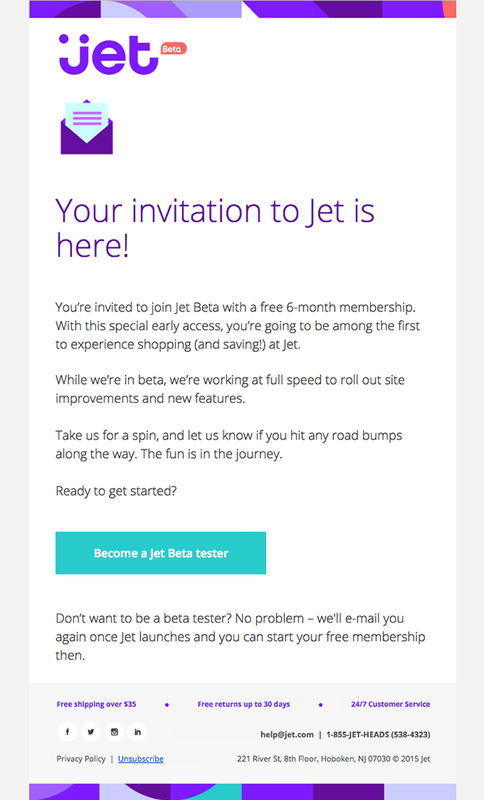 For more inspiration, check out these highly effective welcome email examples. Ask your customers how often they wish to receive your emails, and give them the option to select the type of emails they want to receive. Do they want blog posts updates, discounts, important updates, or all of the above? 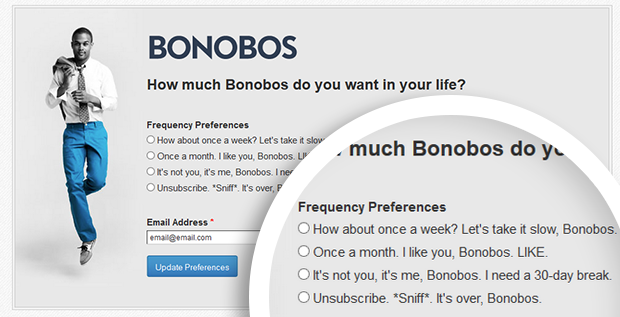 Bonobos gives their subscribers a chance to update their frequency preferences when they click “unsubscribe” in an email. As a result, Bonobos retains 25% of those subscribers who would have otherwise opted out. Use your data on your subscriber’s interests to curate content that you know they’ll love. 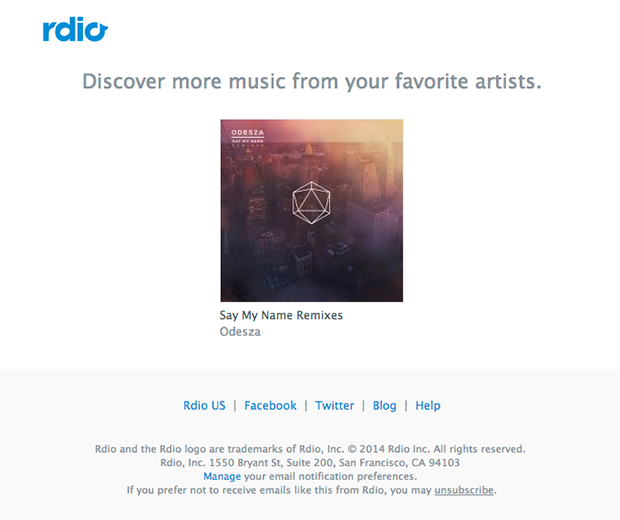 Rdio uses their data on what music you listen to in order to create targeted emails that recommend more music by your favorite artists. 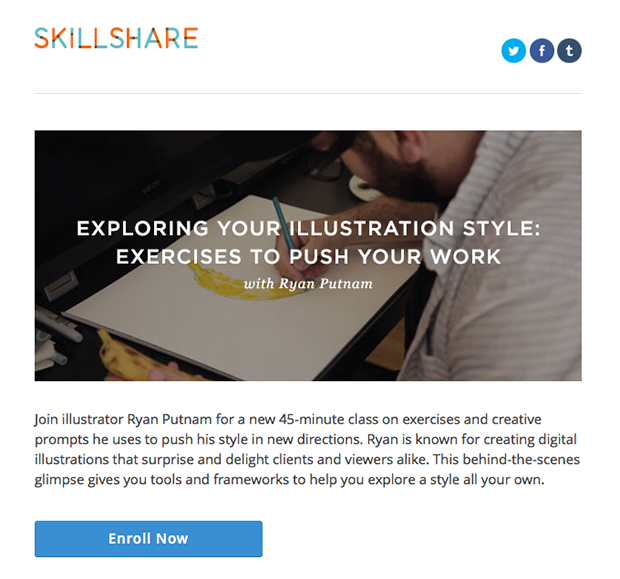 After signing up for their email list, Skillshare sends you opportunities to enroll in courses that match the criteria you specified when you signed up. Unless people travel across the country or the world to attend your events, you probably don’t want to blast your entire email list every time you have an in-person event in a particular city. Instead, use your subscriber’s location to send targeted emails to let them know about upcoming events in their area. Use information about your subscriber’s open rate to segment subscribers who frequently engage with your emails vs. those who engage less frequently. For example, you could reward your more engaged subscribers by giving them special opportunities, like beta access to your new program before anyone else even hears about it. If your subscribers have been inactive for a little while, remind them of the next step that you want them to take. 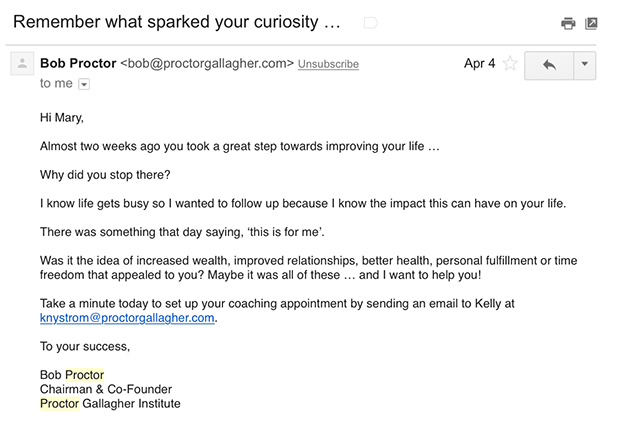 The Proctor Gallagher Institute segments subscribers who opted in for a free coaching appointment, but still haven’t followed through after two weeks. 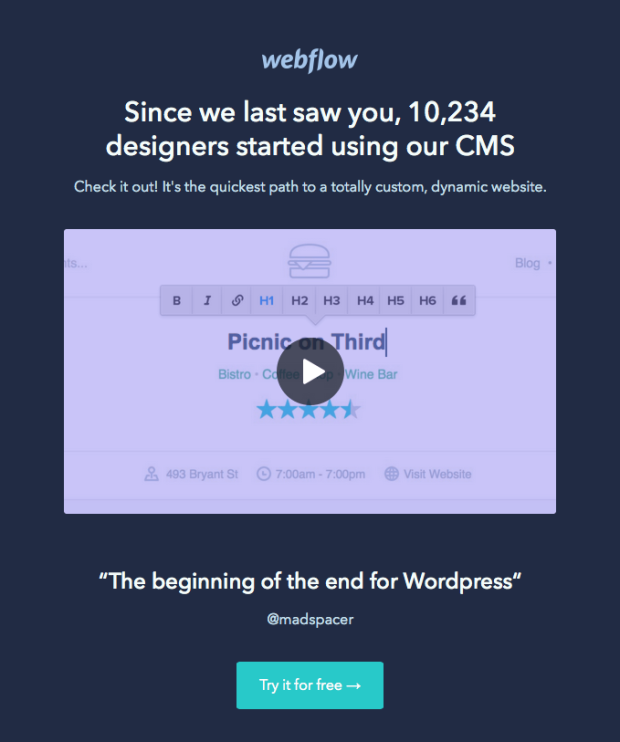 Webflow uses social proof to draw inactive users back to their platform. They let you know how many new users they’ve had since your last engagement, so you’ll get on the ball for fear of missing out on what everyone else is doing. 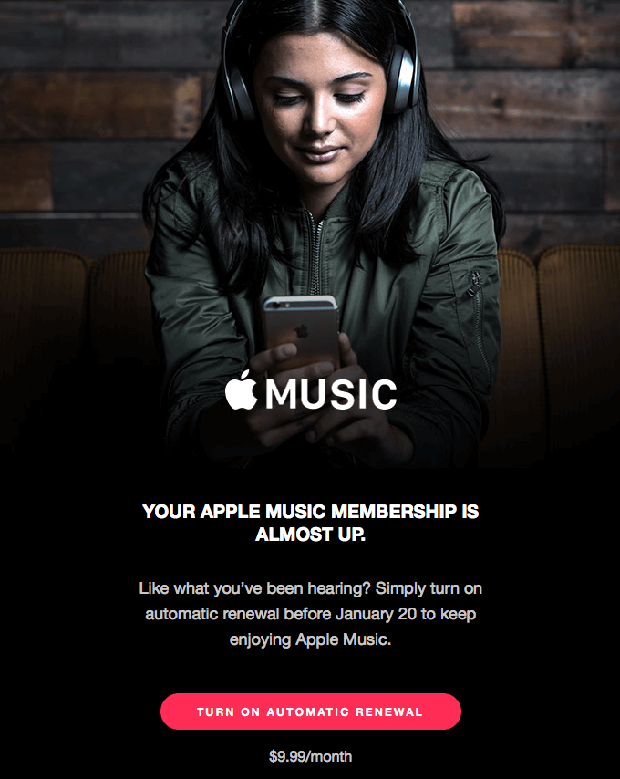 For subscribers who have been inactive for a long period of time – say two months – you may want to send out a targeted email to see if they still want to hear from you, or if they would rather unsubscribe. This way, you keep your list fresh. Segment your subscribers by the specific lead magnet that they opted in for. 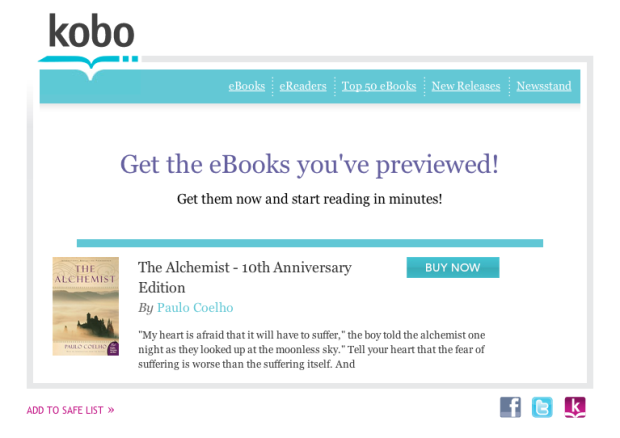 After downloading a free preview of an eBook, Kobo sends you an email inviting you to purchase the full version. Everyone learns in different ways. Some subscribers may prefer to attend your live webinars, others prefer to read your summarized PDF reports. When you segment your subscribers based on the type of lead magnet that they initially opted in for (and any additional types they opted in for later), you can continue to give them the type of content they like best. Some of your subscribers opt in for one of your lead magnets, while others may opt in for multiple lead magnets. Create a segment of subscribers who opted in for more than one lead magnet, and you’ll know who is most likely to want to hear about any new lead magnets that you have coming out. Then, you can notify that segment about your new lead magnets without pestering your other subscribers. How about targeting visitors who started to fill out a form on your website, but never completed it? For example, you may have a web app with a free trial that requires a signup. A certain percentage of your visitors are going to start to sign up and then either change their mind or get distracted. 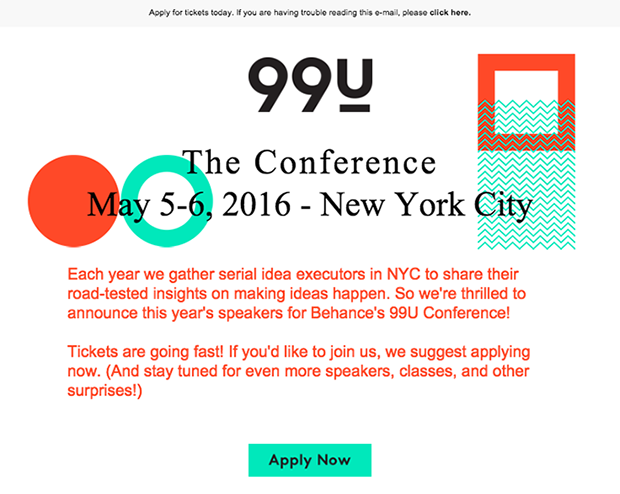 You can recover those signups by sending them an email reminding them to finish the process. Shopping cart abandonment is a common issue for eCommerce sites. Thankfully, you can use targeted email marketing to re-engage those shoppers. 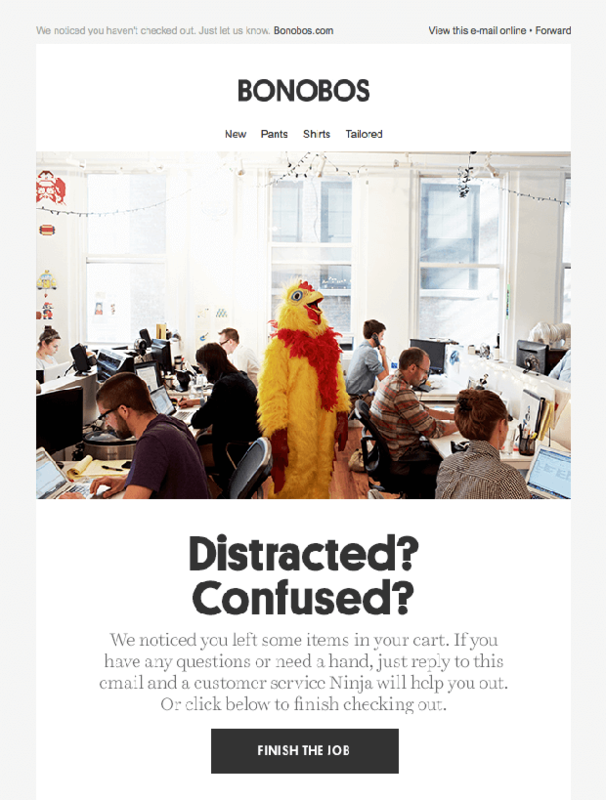 Here is a fun example from Bonobos. The main call-to-action in this email is to “Finish the Job” (finish checking out). The secondary call-to-action is to reply and talk to a “customer service Ninja” with any questions or if you need help. 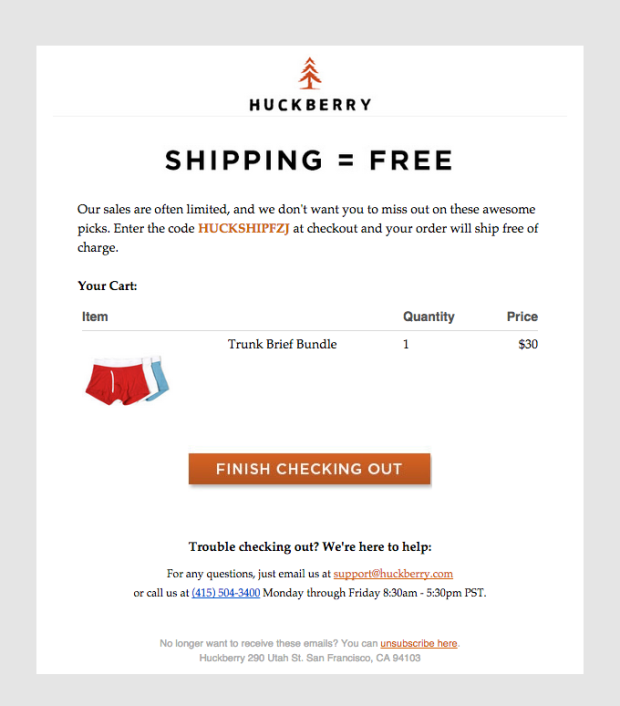 For more inspiration, see our roundup of the best abandoned cart email examples. Perhaps your visitor missed out on an opportunity to buy something altogether. For instance, you may have launched a product for a limited time, and now they’ve missed the window of opportunity to buy. What is the next step for these subscribers? The first thing you may want to do is send them some really valuable free content, to remind them of why they wanted to follow your brand in the first place. Maybe they didn’t buy because they don’t know your brand well enough, or they don’t have enough trust for you yet. Build a stronger relationship with these subscribers, and the next time you have something to offer they will be much more likely to buy. Use your customer’s purchase history to offer cross-sells or up-sells. 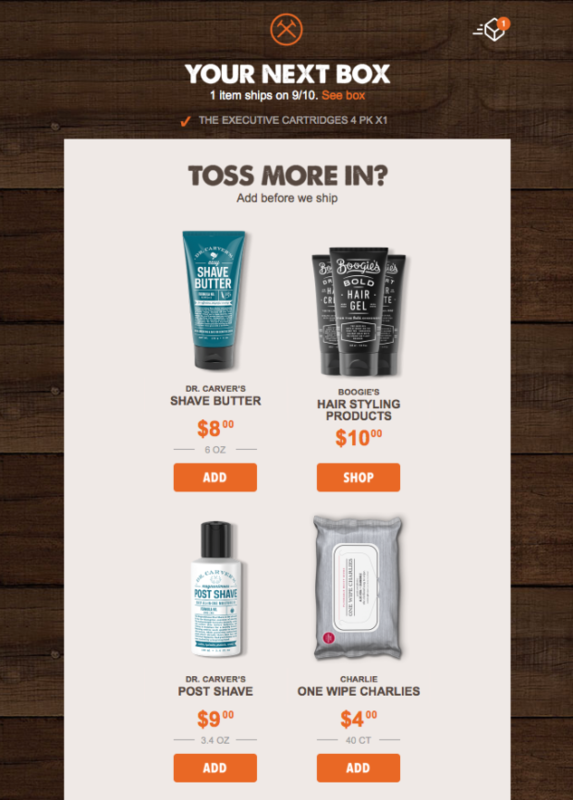 For example, the Dollar Shave Club sends you an email before the box you ordered is set to ship, while you still have a chance to add on more items. Why not toss in a few more while you’re at it? Segmenting your customers by the amount of their purchase allows you to offer them an appropriate up-sell on the backend. You can also give special treatment to customers with especially large purchase amounts by offering them a free “thank you” gift, or some other bonus that will reinforce in their minds that they made a good decision by buying from you. Especially if you offer a lot of different types of products, segmenting your customers by purchase type is a great way to determine what their interests are so you can offer curated products that you know they’ll love. 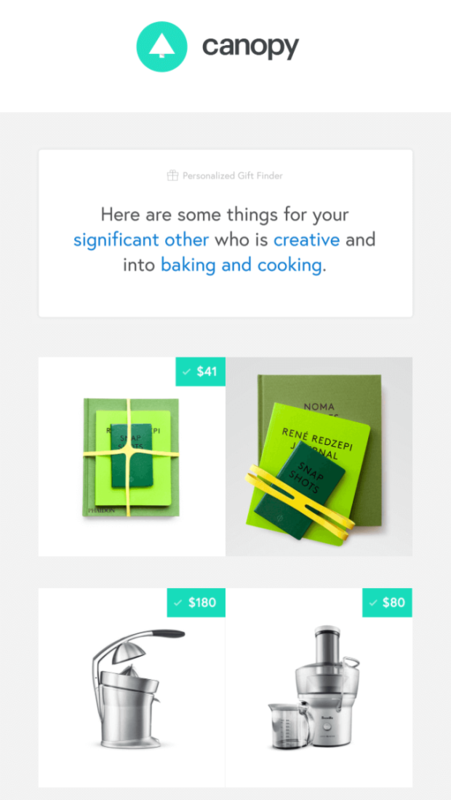 Here’s an example of a curated email from Fab, an accessory shop. Reward your frequent shoppers with a special coupon just for 3rd time buyers, or an invitation to join your loyalty program. On the flip side, you use targeted email marketing to encourage one-time customers to come back for seconds. You can use their answers to segment your list based on Net Promoter Score (NPS), or those who have a high score between 9-10 (“Promoters”), a medium score between 7-8 (“Passives”) and a low score between 0-6 (“Detractors”). Certain purchases have a cycle: they are seasonal, or they occur at certain times. Knowing where your customers are in their unique purchase cycle can guide your email marketing campaigns. For instance, let’s say you sell diapers, and one pack usually lasts for one month. When the customer is probably starting to run out of diapers (say, 21 days after their purchase), you might send them a friendly reminder email asking them if they’re ready for a new shipment. Each subscriber’s stage in your sales funnel should determine what email they receive next. New subscribers need to be nurtured. Warm leads need to be primed for the sale, and eventually sold. Customers need to be presented with cross sells or up sells. Every stage should have it’s own unique email marketing campaign. Sometimes people simply get busy and they stop engaging with your emails like they used to. This can happen no matter what you do. However, if you don’t do anything to re-engage those subscribers, you could lose them forever. 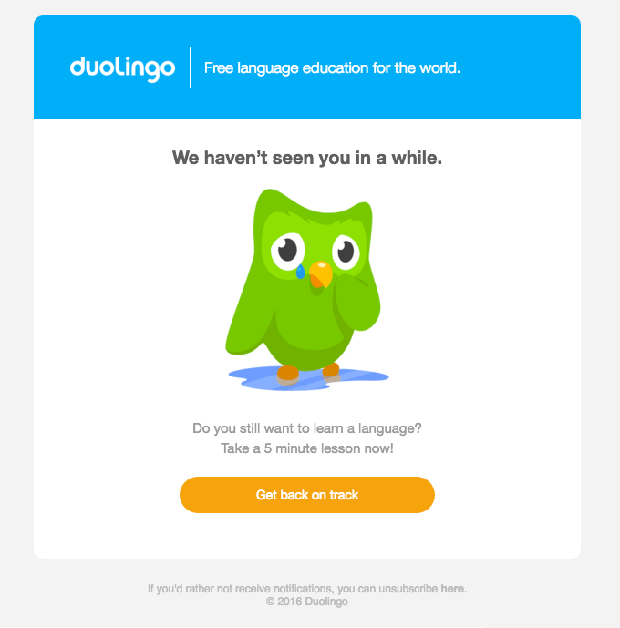 Duolingo is sensitive to the fact that you’ve probably been busy, so when you haven’t logged in for a while they send you a targeted email with the call-to-action to take a 5 minute lesson to get back on track. Anyone can spare 5 minutes, right? Particularly if you offer a monthly subscription, or you have a product that needs to be re-purchased on a regular basis, you should check in with customers when they change their purchase behavior. If a customer cancels their subscription, you might want to send them an email to ask them why. Even if you don’t get that customer back, their answer will help you to improve the experience for future customers. 49% of email marketers still don’t segment their lists based on device habits. 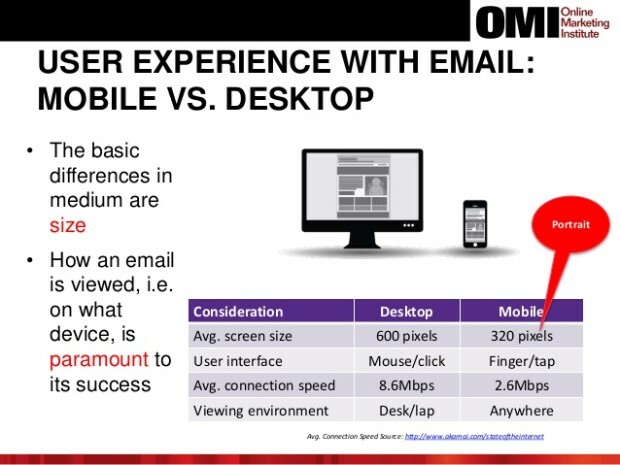 However, the email reading experience is completely different depending on whether you are reading on your mobile phone or your desktop. 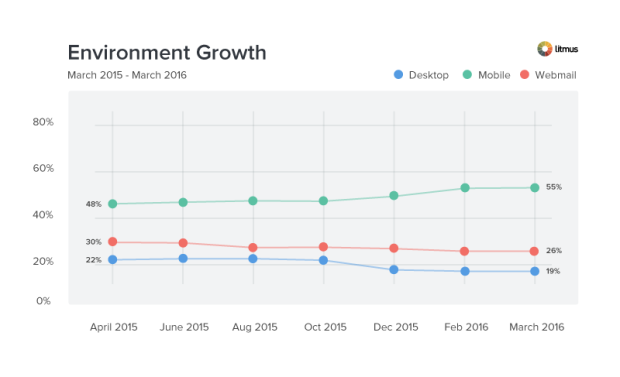 According to Litmus’ data of over 1 billion emails, mobile email is dominating at 55% of all email opens (a 7% increase over last year). 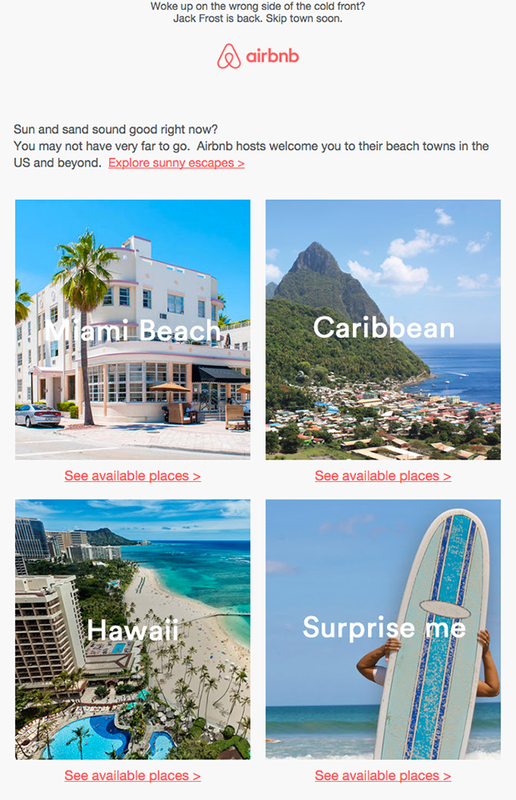 This trend is expected to continue, meaning that responsive email design will be more important than ever, so make sure you are segmenting your list based on your subscriber’s device. 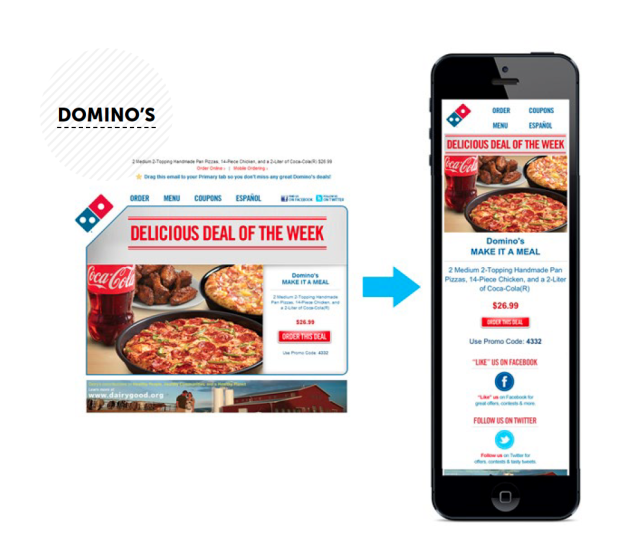 And don’t forget – you should target your popups and opt-in forms to your mobile audience as well! If you want to refine your email design even more, you can segment by the different email clients that your subscribers use. Perhaps an even better use of this segmentation, however, is to interpolate what other services your subscribers have along with their email provider. For instance, HubSpot suggests asking everyone who has a Gmail address to add your blog to their Google Reader. Do you have an affiliate program? Don’t forget about your affiliates! Nurturing that relationship will really pay off, so make sure you have specific email campaigns just for them. For example, you could run a contest for your affiliates and offer a big prize to whoever has the most sales over the next 30 days. You can even send email updates to your affiliates as the contest progresses, showing off the “leaderboard” of affiliates who are currently in the Top 10. Maybe you don’t have an affiliate program, but you do have subscribers who referred you to their friends. These are highly valuable subscribers who should be treated with special care, so give those people a special tag. Once tagged, you can give these evangelist subscribers a special “thank you” gift, an exclusive discount, or VIP access that no one else gets. Let them know how much you appreciate them for spreading the word about your brand, and they will show you undying loyalty. Your customers can be your best brand advocates, but only if they take action by sharing their experience. Customers who haven’t left a review yet can be sent a targeted email with a friendly request to leave a review. 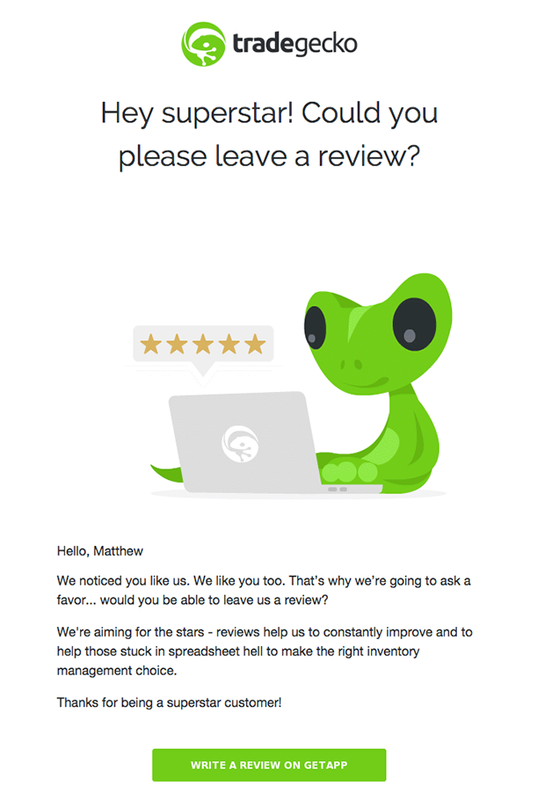 TradeGecko does an excellent job of this by first complimenting the customer, then making their request to leave a review, and closing the email with another compliment. If you have both a brick-and-mortar plus an online shop, segment your customers by where they shop. That way, you can provide specific information to your brick-and-mortar customers about in-store only promotions. Do you have different customer profiles who are worth more or less over their lifetime as a customer? Be sure to segment those out so that you can really focus in on those customers who are worth the most over the long-term. For example, you might have one segment of consulting customers who hire you to give them advice, and another segment who hires you to provide them with high-end, done-for-you services. The done-for-you customers have a much higher lifetime value, so you may want to give them some special treatment. Monitor your subscriber’s activity on your website so you know exactly what they are looking for. 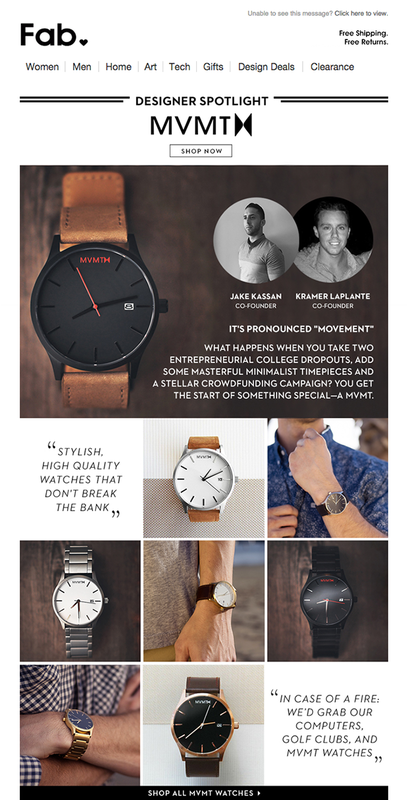 For example, Canopy takes your personalized data collected from their website to curate very specific items for you. Not only that, but they tell you the exact criteria they used. It’s like they read your mind! You can also use website inactivity to segment your email list and get those users back on task. Handy flags users who got a free credit, but never actually claimed it on their website. 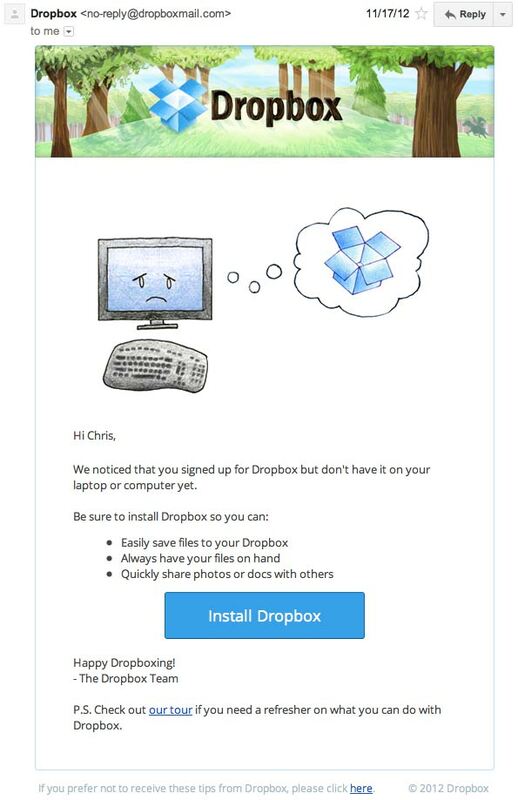 Dropbox sends you an email when you sign up for their service but don’t follow through with the install. Use your website visit data to send targeted email campaigns to subscribers who visited your web store or your sales page but didn’t purchase. For example, you could let them know that the offer is about to expire. Or, you could offer them free shipping or a free bonus to sweeten the deal. Most businesses have more than one buyer persona. These personas usually have different needs and respond to different copy, so why not send targeted campaigns to each? You can create targeted email lists by separating your subscribers into various buyer personas by looking at what they’ve opted in to, what they’ve clicked on inside your email campaigns, and their behavior on your website. 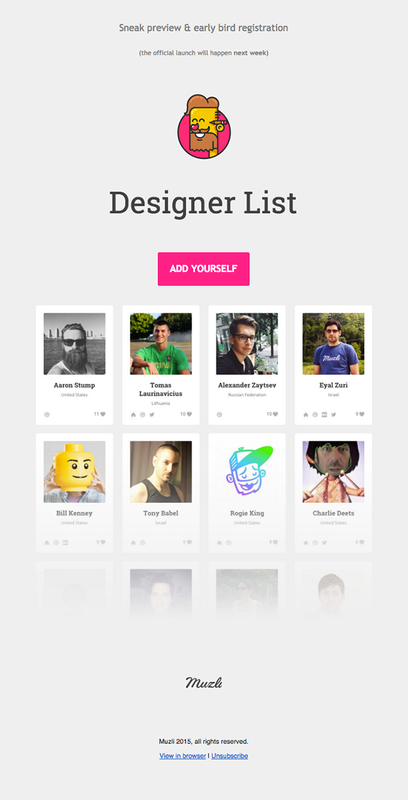 Use that collective info to create segments for each of your customer profiles. 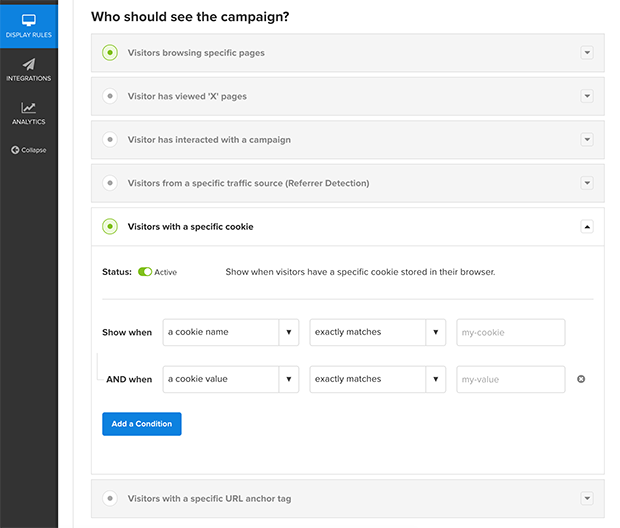 OptinMonster’s page level targeting makes it easy to segment by buyer persona. You can use display rules to target specific buyer personas with a specific opt-in form, and then automatically add those subscribers to a segment on your email list. What does your subscriber do for a living? Are they a designer or an art director? Are they a salesperson or a customer service representative? Each job title has different pain points which can be addressed separately with segmentation. When it comes to making the decision to purchase your product or service, your subscriber’s seniority in their company often plays an important role. For example, a busy manager may want to know that your solution is something that they can delegate to their employees. On the other hand, the employee will need to have compelling reasons to give their manager for making the purchase, since their primary motive is to make their manager happy. How skilled is your subscriber at the discipline you are trying to help them with? Are they a complete beginner or fairly proficient? Or are they already advanced, and looking to take their skills to an even higher level? The content you send to your subscribers can vary greatly depending on the skill level of your audience. So knowing what level to speak to them at can be extremely helpful for your campaigns. Segmenting by birthday is a nice thing to do for your subscribers, and it makes them feel special. 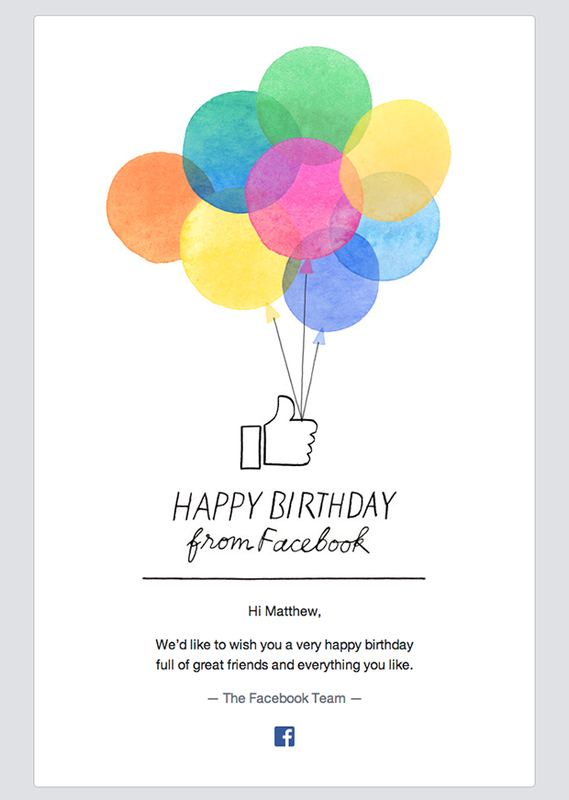 By sending them targeted emails with special offers, or even just a simple “happy birthday” note, you can connect with them on a much more personal level. As you can see in this example from Facebook, you don’t necessarily have to give them anything except a friendly greeting. After all, who doesn’t like to be remembered on their birthday? Does weather play a role in your subscriber’s behavior? Use what you know about the weather in their area to entice them to take the action you want. What can you deduce about your subscriber’s psychographics from your data? Psychographics are traits like personality, values, opinions, attitudes, interests, and lifestyles. If you know what makes your subscribers “tick”, targeting emails to them will be so much easier and more effective. You can collect your data from lead magnets downloaded to clicks and website activity to “profile” your subscribers by psychographics and send them targeted emails that focus on just what they need from you. Use your data on who attended your events to send segmented emails. 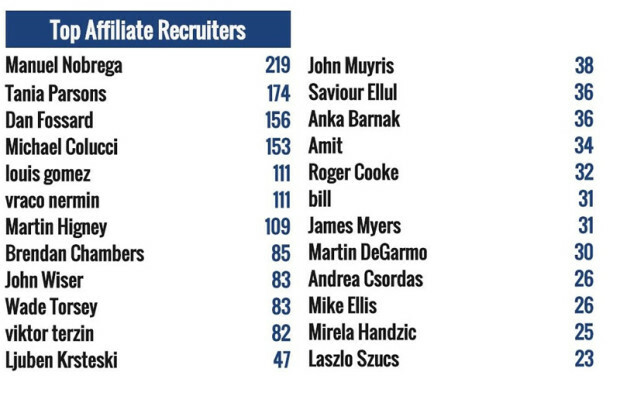 For example, you could keep track of people who attended your webinar vs. those who registered but never showed up. Or, you could have a segment of subscribers who attended your in-person event so you can send them photos from the event, and notify them about the next one you have coming up. If you collect industry information about your subscribers, you can tailor your email content so it is highly relevant to them. 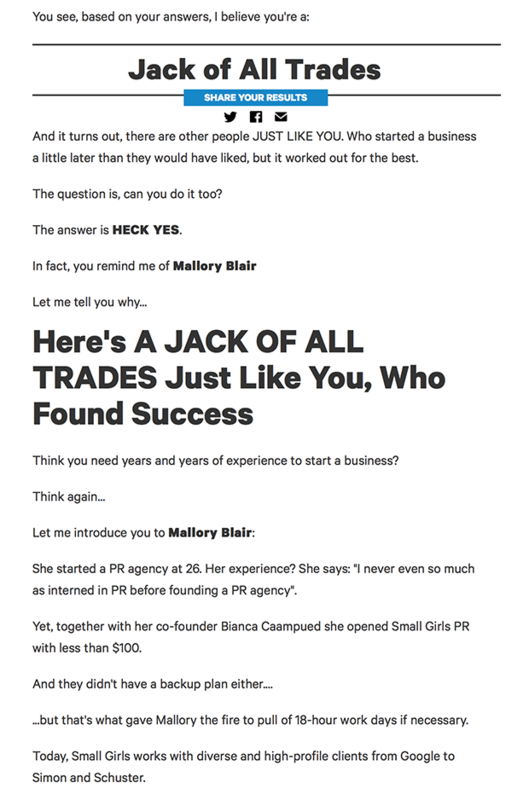 Perhaps you have written a blog post about how to market your business. When promoting that blog post to your email list, you could send one email to your real estate subscribers that explains how this blog post will help them get more clients. You could send another email to your restaurant owners that explains how your blog post will help them get more customers through the door, and so on. If your subscribers have their own business, you can segment by the type of business they own. Are they an eCommerce or a brick and mortar? Are they a franchise or a non-profit? Are they an enterprise or a small business? Each business type has it’s own unique needs that you can specifically address by segmenting. If you sent out a survey, send something special to those who participated. They will be glad to know that you respect and appreciate the time they took out of their day to help you out! Is your subscriber’s free trial about to expire? How about their membership that’s almost up? Let them know that it’s time to upgrade or renew. Here’s an example from Apple Music. They make it super easy for you by allowing you to “Turn On Automatic Renewal”. Segment subscribers who registered for a webinar by whether or not they attended. That way, you can re-engage those who didn’t attend with an opportunity to register for the encore. Or you can simply give them a brief summary of what they missed. You can also segment your webinar attendees by how long they stayed on the call. Those who stay for the entire presentation might get a special bonus download, whereas those who drop off early might receive a survey about why they had to go, or what caused them to lose interest. Reward the top 1% of your email list in terms of engagement and purchase activity with something exclusive, just for them. If you have different offerings for men and women, go ahead and segment your subscribers by gender. Adidas sends out two completely different email campaigns. You’ll get one or the other depending on whether you’re male or female. Sometimes segmenting by your subscriber’s age can be important in relating to them better. Segmenting your subscribers by income can be helpful. For instance, some subscribers need different information depending on their current income. If your subscribers are small business owners, one segment may want to learn from you about how to grow their 5-figure business to 6-figures. Another segment might want to know how to scale from 6-figures to 7-figures. Yet another segment may just want to know how to make their first 2K month. In some cases, it may make sense to segment based on level of education. For example, if you are an educational institute, you may need to send different content and promotions to subscribers who’s highest level of education is a High School diploma, versus those who have earned their Bachelor’s degree and are looking to get their Master’s. If you are a career coach or a recruiter, you may need to segment based on employment. Your groups might look something like this: 1) subscribers who want to change careers, 2) subscribers who are unemployed and looking for employment, 3) subscribers who simply want to “climb the corporate ladder”. That’s it! 50 smart ways to segment your email list. If this list seems overwhelming, don’t worry: you don’t need to use all of these ideas. Just choose one or two to start. You can keep referring back to this list as your needs grow and your email marketing campaigns become more sophisticated. Which ideas do you use to segment your list? Any that we missed? Let us know in the comments! Your website visitors all behave differently. OptinMonster makes it easy for you to segment your email list and unlock the highest potential revenue from each website visitor. Get started with OptinMonster today and start converting more visitors into subscribers and customers! Great article Mary, thanks for the ideas. My email list consists of healthcare professionals in private practice. I have them specify which field when they join my list. I thought that would be important for the future and set it up this way. I am not sure how to further segment still because ultimately, they all want the same thing. How do I get more patients in the door of my practice? Thoughts? Glad you enjoyed the article, Michael! To get more patients in the door of your healthcare practice, you’ll need a good content marketing strategy that gets you local traffic. For instance, you could target search terms like, “[your town] + [your practice]” (e.g. “San Diego dentist”). Then, you’ll want to get that traffic to convert by giving them an incentive to walk in your door (e.g. you could have an exit popup with the offer of a free teeth cleaning). I’m not sure why you are building an email list of other healthcare professionals… Does your local business also serve that market? This is really an awesome post and I got some new and fresh idea from this. I have bookmarked your blog. Thanks a lot! Segmentation is very important. I started using them using content upgrades on my blog which also has helped me stay organized. The only email that I blast out to everyone are Webinar trainings that relate to all aspects of growing a home business. Besides that content upgrades and segmentation has been working great! Some excellent tips Mary! Thanks! I also started using segmentation when switched my ESP to Mailerlite – didn’t find them in your list, but they are offering really decent segmentation yet I can easily import & export my subcribers! After reading your article will try to implement some of your tips! Thanks again! I am brand new to all this. In fact I’m only looking at this as I want to do a Kickstarter but first have an email list I can campaign to. 1) I have my own personal contacts. How can I segment these if they are in Google Contacts? Export as? Direct into MailChimp? 2) I want an Email Generator landing page but as this will be for a non-existent product I won’t have multple pages for them to visit to offer different Leads to help me segment. Is there a way to do this? Hi Blake, Mailchimp allows you to import Google Contacts; other email marketing services may, too. It’s probably best to create groups in Google Contacts, then export each separately. That will allow you to create either different lists, or to create segments as you import each of them.